Art Dubai, the largest art fair in Middle East, has closed on 24th of March. Anna Arutyunova, art-critic and art market specialist from Moscow, visited it. She tells Arterritory readers about the most interesting and significant projects and tendencies she has learned about. The art fair Art-Dubai for the first time took place in 2006. It was invented by John Martin, art dealer and gallery owner from London, and entrepreneur Benedict Floyd for Western art dealers and gallery owners looking for new customers in the Middle East on the wave of unprecedented economic growth. Local wealthy people were eager to invest in contemporary and classic art, however, their ardency got chilled by global financial crisis, but not stopped whatsoever. Thus, in January opening dates for Saadiyat Island Guggenheim Museum and Louvre (2015 and 2017 respectively) were announced in Abu Dhabi. These dates were postponed several times, and there were even doubts growing over the ‘cultural’ building to ever be finished due to its scale (the Abu Dhabi Guggenheim Museum after Frank Gehry Project is 42 000 square metres large). Though, less massive projects seem to be developing well. Two art museums are functioning successfully in Doha: Cai Guo-Qiang’s exhibition is currently taking place in Mathaf (Arab Museum of Modern Art), and exposition ‘Gifts of the Sultan’ has just opened in MIA (Museum of Islamic Art). Clusters of modern art galleries are also forming in Dubai, and Sharjah Biennial is getting ready for the opening in March 2013 (Yuko Hasegawa, chief curator of Tokyo Museum of Contemporary Art, recently was selected to curate it). In past years Art Dubai has also turned into the region’s important centre of modern art. Since 2010 it is run by Antonia Carver, who has joined Bidoun Magazine, Middle East art oriented magazine, published in New York, and Bidoun art centre. She overtook management of this rapidly developing dynamic entity. It attracts both independent curators and those of the museums, as well as art dealers from around the globe. ‘This art fair is rooted in Middle East and Eastern Asia; however, it has to serve as the reflection of the global nature of art’ says Antonia Carver. She points that her main goal is to turn the fair into the meeting place for Eastern and Western experts. So far, she is succeeding. This year 75 galleries featured Art Dubai, and their contribution answered most diverse cultural, religious and political tastes. Sponsorship helped create versatile non-commercial program that is an attribute of any advanced art fair. As a part of Art Week, timed to coincide with Art Dubai, there were performances, special projects, presidential grants for artists and curators, the small design fair, as well as the young art fair named Sikka, and also a forum on art media (featuring art curator Hans-Ulrich Obrist, novelist Douglas Coupland, LACMA director Michael Govan and art collector Sultan Sooud al Qassemi). Abraaj Capital Company, which lends great financial support to the fair, has at some point created media rush around art market of Middle East: in 2008 Company purchased the work of Mohammed Ehsai for its corporate collection. 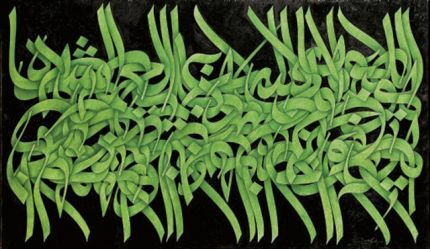 The huge canvas with green bands on black background forming the name of the painting ‘He is The Merciful’ in Arabic ligature, was purchased for record-breaking 1.2 million dollars with 100-150 000 estimated. Since 2006 number of galleries in Dubai has reached 40. They are mostly located in two parts of the city: representational and expensive ones at the Dubai International Financial Centre (DIFC) and young and dynamic ones in Al Quoz area that lives in the permanent building state. Some, like Ayyam Gallery, are running two offices: their DIFC gallery presents Othman Moussa and his oil canvas, which give both conceptually and formally restrained comment on consequences of the Arab spring; meahwhile, in Al Quoz area works from Khalem and Hisham Samawi private gallery are on view, among them Oleg Dou’s sterile photos and photographic documentation of bloody scenes from the Day of Ashura (traditionally it is celebrated by public self-torture). Ayyam Gallery occupies one of the biggest stands at the fair and demonstrates works of artists from Lebanon, Syria and other countries of the region. Gallery owners plan to open offices in London and New York soon. Among other high rollers there are such galleries as The Third Line, Green Art Gallery and Gallery Isabelle Van Den Eynde (IVDE). They all have been distinguished by councils of the most important Western fairs, and soon are heading their direction. In May The Third Line will participate in Frieze art fair in New York. At Art Dubai it presented works of young artists from Iran and Iraq (who all live and work in USA). 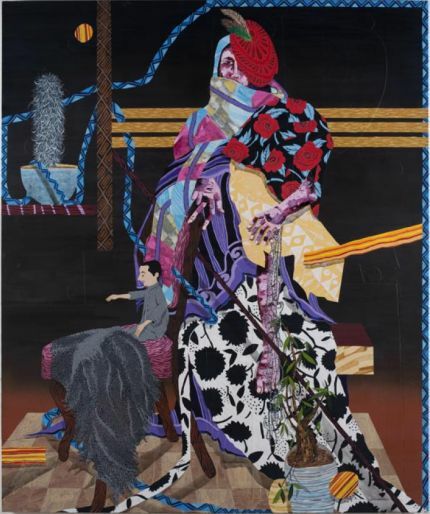 Amir Fallah is the author of bright colourful collages with meaningful names (for instance „First One to Trust, Last One to Live”). 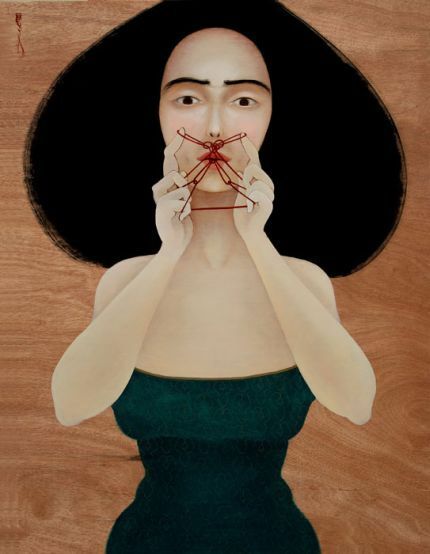 Hayv Kahraman, who arcquired her art education in Italy, paints on wood or cotton. She depicts female puppet figures hung on strings doing everyday jobs, like ironing, piling up the cloth or simply looking in the mirror. Two other galleries of Dubai, who work exclusively with artists from Middle East, have passed the selection for Statement section at Art Basel, the most prestigious art fair in the world. Local galleries don’t have any trouble choosing works for Art Dubai – the entire fair is local collectors and local culture oriented: participants are even given a notice not to present works that can be misinterpreted. On the walls, there is a whole lot of variations on Arabic ligature, also collages, glitter and works based on acknowledging traditions of Arab world. There are especially many fantasies about rug weaving. For example, Athr Gallery, the only gallery from Jeddah, Saudi Arabia, presents rugs in all possible ways: Ibrahim Abu Mismar created rug from copper, Ayman Yossri Daydban shows a sort of rug weaved from paper tissues, and Nasser Al Salem printed his calligraphic patterns on fabric. Western galleries are easier going in the sense of choice. Some of them never orient their expositions to their local visitors. Thus, Goodman Gallery, South Africa, has organized William Kentridge exhibition. According to gallery owner, artist’s works enjoyed great success at past Art Dubai, and during this year’s fair preview members of the ruling family have shown interest towards several items (the fair itself is run under the patronage of Sheikh Mohammed bin Rashid Al Maktoum). There is a rug – huge 4.5х4.5 meters mohair rug that looks like a wefted collage with recognizable figures from films and drawings of William Kentridge. Three important Western galleries first featuring Art Dubai, have brought diversity to their expositions to the most. The Pace has filled their stand with works of artists representing every city the gallery has office at. Since The Pace runs offices in London, New York and Beijing, there are works of Zhang Huan, Tara Donovan and Turner prize awarded Keith Tyson. 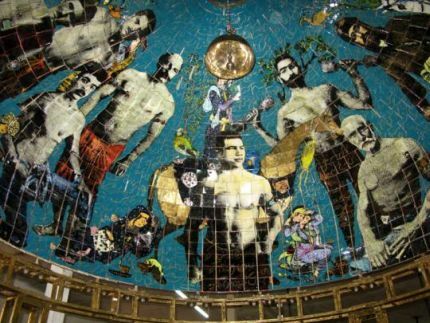 Gallery Arndt, Berlin, has similar multicultural exposition: there is a huge five metres high paved dome created by Iranian artist Khosrow Hassanzadeh, as well as bright canvas of Indian painter Jitish Kallat, and works of one of German contemporary art exponents, co-establisher of group ZERO, Heinz Mack. However, the most impressive stand belongs to Galerie Perrotin, the French art market heavyweight. It is presented by commercially top-ranked artists: Wim Delvoye, Bharti Kehr, Farhad Moshiri, Takashi Murakami and French duo Kolkoz. Their works definitely are an attribute of the perfect contemporary art collection in any part of the world. However, some of the Western galleries stick to different policy. 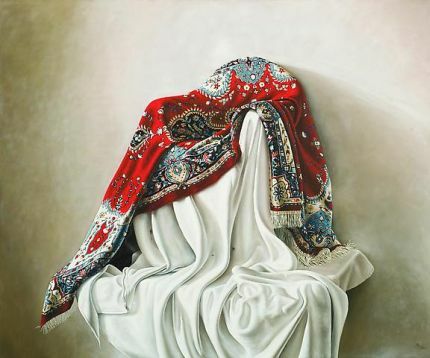 Priska C. Juschka Fine Art, New York, has brought only artists associated with Arab world, even if they don’t form the base of the gallery’s range. There is, for example, Nicky Nodjoumi, who moved to New York after revolution in Iran, and Almagul Menlibayeva with her series of performances and photo stories taken in the steppes of Kazakhstan. ‘Why show works that don’t make sure they catch the eye of the purchaser?’ says gallery owner, who brings artists from Middle East and Central Asia to Art Dubai for the third time.